Neither the MENA governments nor the international community can afford to let the region’s young down. It is time to effect change to give MENA youth what they really need to succeed: jobs above all else. 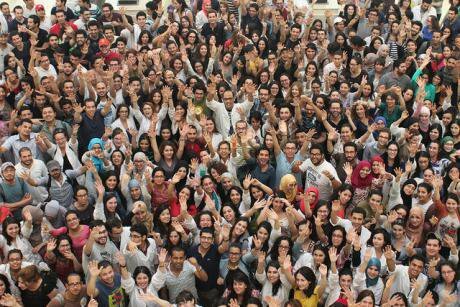 Tunisian medical students, 2014.Flickr/Amine Ghrabi. Some rights reserved. The Middle East and North Africa (MENA) is going through paramount changes that are affecting, directly or indirectly, almost every single country of the region and beyond. While immediately after the 2011 first Arab uprisings, a wave of optimism swept the region, hopes for a better future have faded, especially for the young. In the MENA now, to different degrees, there is a crisis wherever we turn, resulting in a massive increase in the number of refugees worldwide. In the MENA now, to different degrees, there is a crisis wherever we turn, resulting in a massive increase in the number of refugees worldwide. According to the United Nations High Commissioner for Refugees (UNHCR), 65.3 million people have been forced from home, of which 21.3 million are refugees (persons fleeing armed conflict or persecution). The Syrian conflict, in particular, but also the intensification of several other conflicts in the MENA, as well as in neighbouring areas such as Afghanistan, the Sahel, the Horn of Africa and northern Nigeria, are leading millions to flee their homes to settle in many MENA countries or to use them as gateways to Europe and elsewhere. This is putting further pressure on the region’s already strained economies and on the international community at large. While over 1.5 million people are estimated to have arrived in Europe by sea in 2015-16, UNHCR figures indicate that 39% of the world’s displaced (or 25 million) are being hosted in the MENA. But not all who leave their homes are escaping conflict. Many young men and women decide to migrate to seek better job and living opportunities elsewhere. The number of international migrants (persons who choose to move not because of a direct threat of persecution or death, but mainly to improve their lives by finding work, or in some cases for education, family reunion, or other reasons) has continued to grow rapidly, reaching 244 million in 2015, according to the United Nations (UN). Almost three-quarters are of working age. In a comprehensive 2016 survey of 10,000 young people in five Arab Mediterranean countries – Algeria, Egypt, Lebanon, Morocco, and Tunisia – as part of the European Commission-funded SAHWA Project, 86% of respondents cited lack of professional opportunities, lower income, and poor living conditions as reasons for wishing to emigrate. Strikingly, over half of young Tunisians said that they would like to leave their country. In relation to choosing where to emigrate to, most respondents cited rich job opportunities in the host country as the main decision driver. At 30%, youth unemployment in the MENA is among the highest in the world – it is more than double the global average of 14% and considerably superior to the 25% registered in the EU-28. Countries like Egypt have a record high of 42% and a staggering 64.8% in the case of young females. The MENA’s population is also one of the youngest worldwide. Nearly one in five people is between 15-24 years old, compared with one in eight in the EU. While a youth population this large should give a competitive edge to the area, around 25 million working-age youths between 15-24 years of age find themselves out of a job. It is estimated that people who begin their careers without work are likely to suffer a wage penalty of up to 20%, lasting for around 20 years, says The Economist. In Egypt, 88.5% of the total unemployed suffer from long-term unemployment (one year or longer). Also, after years of searching for employment with no success, many young people may become discouraged and decide to leave the workforce – in the MENA, already two out of three working-age youths do not participate in the labour market and, in some countries, one in four are not in employment, education or training (NEETs), compared with one in eight in the EU-28. In addition to representing a huge loss of productive capacity, as it increases the dependency on older generations, this can also lead to frustration, which in turn becomes a potential source of social unrest, violence, fundamentalism, or a motive to emigrate as the SAHWA Youth Survey 2016 has found. 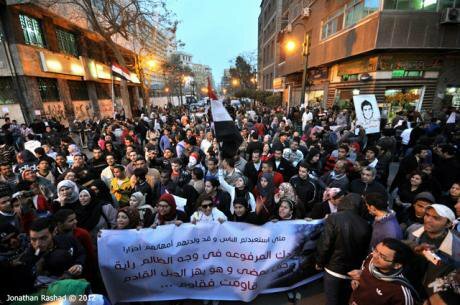 On February 21, 2012 thousands of university students marched from Cairo University to commemorate the 66th anniversary of Egypt's 1946 student and workers uprising. Flickr/ Jonathan Rashad. Some rights reservedThe International Labour Organisation (ILO) estimates that 40 million new jobs need to be created per year until 2030 to keep pace with the growth of the working-age population worldwide. In the MENA alone, there is a need for 5 million new jobs per year, requiring sustained annual growth rates of at least 6.5%, over three times the regional average for 2015 (2.9%). That said, companies working in the region are having difficulties filling jobs that have already been created. While in most advanced economies the jobless rate for people with less than a secondary-school education is twice as high as for those with university degrees, in the MENA unemployment tends to increase as education increases. In Egypt, unemployment among diploma-holders is eight times higher than among those that have only completed primary education. The situation is far worse for young females, where unemployment among women with degrees is 30 times higher than among those with primary education. In Palestine, unemployment among female diploma-holders surpasses 90%, compared with 2% among those with primary education, according to the World Development Indicators. Flickr. The American University in Cairo. Flickr/ medea_material. Some rights reserved.The quality of education remains an unrelenting problem, despite significant improvements and increased government spending in past decades. As the MENA becomes more involved in the global economy, there has been a major shift in the skills in demand, but regional educational systems continue to focus on preparing students for public-service jobs even as private-sector companies are reportedly struggling to find skilled workers to fill vacancies. There are sectors in the MENA that are growing, but qualified candidates are needed to support such growth. There is a persistent skills mismatch between what employers need and what young job-seekers can offer. And this is a global problem: a 2015 report by employment services firm Manpower indicates that 38% of employers worldwide have trouble filling positions. Demotivation often occurs, not only in terms of looking for employment, but also in terms of wanting to get an education. In Egypt, many young people end up wishing they had never spent their money on an education. At the same time, young people’s aspirations are growing and changing. Students themselves find that their education is not in line with market needs. 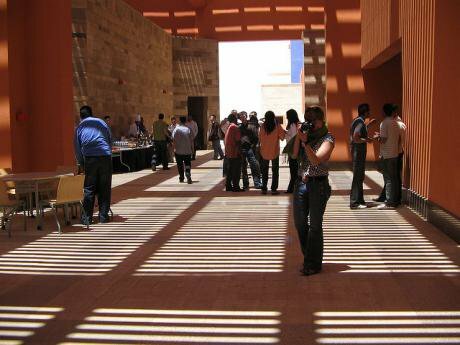 Interviews in Morocco as part of the SAHWA Project revealed that university curricula are mainly theoretical, with no practical application or tests, and are devoid of soft skills or personal development, areas highly valued in today’s business environment. Demotivation often occurs, not only in terms of looking for employment, but also in terms of wanting to get an education. In Egypt, many young people end up wishing they had never spent their money on an education that yields no employment, but would rather have saved it to cover their families’ needs. In Tunisia, most of those fortunate enough to get a job end up working in areas unrelated to their fields of study. In Lebanon, focus groups revealed lack of access, inadequate materials, unprepared lecturers, and discrimination based on political affiliation and socio-economic or religious backgrounds. Similarly, interviews in Algeria showed that those who do find a job are often faced with below-the-market conditions. This is especially the case for young women, as a result of which many prefer not to participate in the labour market. In the next decades, it is estimated that 50 million women will come of working age in the region. Yet, four in five working-age women do not participate in the labour force, constituting 80% of the MENA’s inactive population. This is seriously affecting the region’s potential for social and economic development and represents a great loss of human capital utilisation and returns from education. MENA, with the world’s youngest population, have huge untapped human resources that, if properly employed, could turn the region into one of the world’s largest economic powerhouses. A young, well-prepared population has the potential to spur sustainable growth and development. The MENA, with the world’s youngest population, have huge untapped human resources that, if properly employed, could turn the region into one of the world’s largest economic powerhouses. But the extent to which this youth bulge will contribute positively to societal development depends on how well governments are able to meet the current needs of young people. Failure to attend to these needs is resulting in the marginalization of a large proportion of society, with serious consequences at the local, regional and international levels. Instead of being an asset, MENA youth have become a burden. While the international community’s urgent need and instinct to contain and manage the influx of hundreds of thousands of refugees, the economic and institutional crises that affect many countries worldwide, rampant (youth) unemployment at home, as well as several other ills, are likely to take precedence, international leaders must not forget that their populations’ well-being depends, in large measure, on the well-being of others. This is particularly so in the case of Europe, not least because the proximity of the MENA exposes the continent to instability stemming from the region. Neither the MENA governments nor the international community can afford to let the region’s young down. It is time to effect change to give MENA youth what they really need to succeed: jobs above all else. Two Egyptian girls catch up at the American University in Cairo. Flickr/Asim Bharwani. Some rights reserved.